Homer: What’s everyone so worked up about? So there’s a comet — big deal. It’ll burn up in our atmosphere and what’s ever left will be no bigger than a chihuahua’s head. Bart: Wow, Dad, maybe you’re right. Homer: Of course I’m right. If I’m not, may we all be horribly crushed from above ….. somehow. The comet speeds towards Springfield, through the polluted atmosphere. Chunks of it start to fly off. “Look!” cries Marge, “It’s breaking up!” yells Lisa. 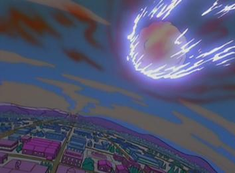 The rapidly diminishing-in-size comet punctures the Skinner weather balloon, then places a direct hit on Ned’s bomb shelter — destroying it in a pile of masonry. Selma: Sure makes you appreciate the preciousness of life. Moe: Let’s go burn down the observatory so this will never happen again. actually picketed against burned up the comet. Lisa: Yeah, Dad was right. Homer: I know, kids. I’m scared too! As all fans of The Simpsons know, Homer is never right. So when all of the scientists predict doom, and Homer predicts that the meteor will “burn up in our atmosphere and what’s ever left will be no bigger than a chihuahua’s head” no-one takes any comfort in his prediction. Of course that’s exactly what happens; the meteor falls harmlessly to earth, and everyone is saved. So, with that, the longest intro ever in the history of the Buy High Sell Higher Blog, what’s my point? Am I saying that all of the doom and gloom I’ve been predicting for the last year will not materialize? Is my point that the massive government spending, and the foreclosure crisis, and the crappy economy is all nothing to worry about, and it will flame out and all our problems will fall harmlessly to the ground? No, that’s not my point. My point is that even a complete simpleton like Homer Simpson can occasionally see the obvious that isn’t obvious to the masses, and he can correctly predict the future. So, for the few thousand of you who glance at this site every week, who are wondering if my predictions of the coming apocalypse are completely crazy, remember the lessons of Homer Simpson. Yes, I have been predicting a severe correction in the stock market, which is why I’ve held 80% of my portfolio in cash for most of the year. Yes, it’s true, that at the start of the year I predicted that the Dow would be at 9,000 on September 30, 2010, and I was far too pessimistic (it closed around 10,807). And yes, I did predict that gold would be at $1,400 for gold on September 30, so since gold was around $1,300 I over-shot by $100. However, I did predict $1,450 for year end, and I’m feeling pretty good about that one. So, it’s true, I do not have a perfect prediction record. First, in the last four weeks, the Relative Strength Index (RSI) has dropped from 90 (very overbought) to 51.89, a much more acceptable buy point. In fact, as you can see from the chart, the last time the RSI was at this level was back in the second week of August, when gold was in the $1,220 range, just as it was beginning it’s un-interrupted ascent to over $1,380, for a gain of 13% in 10 weeks. Second, for those of you who like the candlestick charts, obviously a long body indicates extreme volatility on the day, and the dark color indicates that the move was down. I’ve circled the three times on the chart where this has happened, including Tuesday, which was gold’s biggest down day since the end of June. A pattern like this generally indicates we are near a near term bottom. 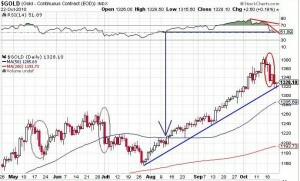 Third, as the blue uptrend line indicates, gold has retreated to the uptrend line that started back in late July, but it hasn’t violated it. That’s good news, indicating we are still in a near term uptrend. Another crash is quite possible. 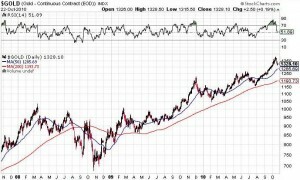 As you will recall, the crash of 2008 was not just a crash in gold; it was a crash in everything. 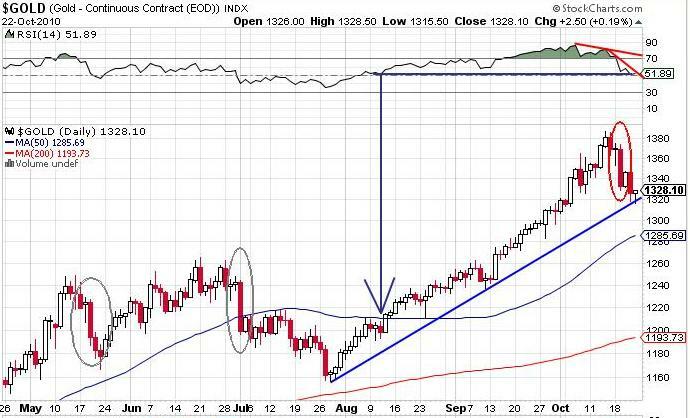 If the market gets creamed, gold could very easily get creamed as well, at least temporarily. Possibility B: The correction has ended; the RSI is now back to the buy level, no trend lines have been violated, and it’s onward and upward from here. There’s a good fundamental case for this position, primarily the fact that Russia, China, and a bunch of others are diversifying out of the U.S. dollar and in to gold. Buying drives up prices, and that’s good news. So which is it, A or B? 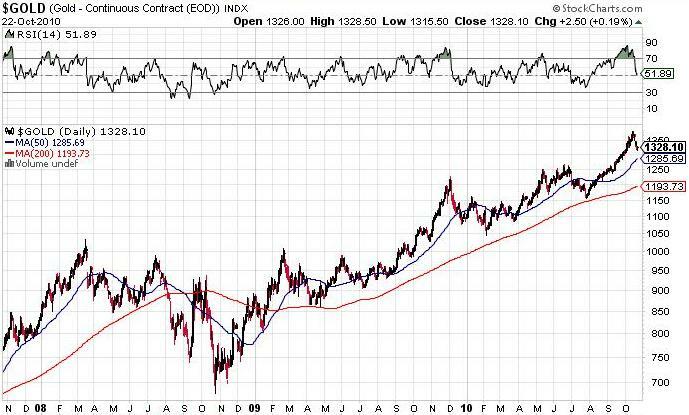 In the long term I have no doubt that it’s “B”; gold is going much higher. In the short term, I have no idea. I continue to believe that we will see extreme general market weakness immediately after the U.S. midterm elections on November 2. I assume that will hurt all stocks, including gold stocks. But I don’t know if that will be a short term drop, or a four month or more drop like we saw in 2008. So, I will take the cautious approach. I will begin to gradually increase my gold holdings, just in case the correction has ended. However I will retain significant amounts of cash so that I have buying power if a severe correction does occur. Obviously these stocks have all dropped in value since then, so on Monday I will buy these options back, presumably for about half of the price I sold them for, or better, to lock in the gain on the options strategy. I could buy 100 shares of AEM.TO – Agnico-Eagle Mines Ltd. for $72.17 x 100, or $7,217. If the share price increases by 10%, I make 10%, or $721. Alternatively, I could buy a contract for 100 December call options, with a strike price of $76, for about $2. If the share price increases by 10% between now and the third Friday in December, the share price goes to $79, so my $76 options are worth $3. I invested $2, so my profit is 50%, much better than the 10% increase on the underlying stock. One contract costs me $200, so if I’m wrong I lose $200, as opposed to putting $7,217 at risk owing the stock. The prudent strategy is to buy the stock for $72, and then sell the November 72 call options for about $2.60. If the share price exceeds $72 by the third Friday in November, my shares are called, and I’m left with my $2.60, for a profit of $2.60/$72, or about 3.6%. That’s not a bad return for a month’s work, given the risk. So, what will I do on Monday? I will close out the options I sold, and then I will probably re-write them to grab more premium. I will probably also place some slightly below market stink bids to pick up more shares on further weakness this week. I probably won’t buy any options, since that’s generally a losing game, but we shall see. The first two weeks of November will be very interesting, so stay tuned; only one more boring week to go.